Wand: Ash, precisely ten inches in length. It's core is a single unicorn hair. Springy where flexibility is concerned, Castor holds his wand with his right hand. It does not please Castor that his most prominent feature is the particularly heavy splashing smallpox scars on his face, arms, and torso, nor is it something he has ever fully accepted. Though it caused him minimal trouble, so far as he can remember, while living in the family home, his early years at Hogwarts saw him a target for much teasing as a result. Castor stands at five feet, eleven and a half inches in height. His build is an agile one, neither heavily muscled nor scrawny in size. His clothing is that which you would expect from a middle-class Muggleborn: good in quality, but just a tad peculiar when it comes to his wizarding peers. Nothing he wears could be considered particularly showy, as he does not like to draw much attention to himself. The more astute in his social circles may notice more recycling in his wardrobe than in his younger year. His dark hair and eyes are the norm in the Allaway family, but his slight nose and chin are the hallmarks of Castor's maternal bloodline. His mixed heritage is evident. ❧ Can cast a corporeal patronus, taking the form of a sea lion. ❧ Some written Latin, but not nearly as good as he would have if he had been muggle! ❧ Above average flying and dueling skills. Only minutes before his brother, Castor was born the first child to George and Elizabeth Allaway of Muggle Edinburgh. A healthy, screaming babe, his delivery was no more challenging than most, though his brother's was something of a struggle for their mother. The boys were brought up outside of the city itself, where their father kept a small residence. Both boys were quick to adapt, quick to learn, and quick to wrap their parents around their fingers. Little of note happened during Castor's earliest years, though by all account they were happy ones. An outbreak of smallpox in the early half of the next decade struck close to home for the Allaway family. The illness was caught first by Castor and Orion, who, visually, seemed to have relatively minor cases. This proved not to be the case quickly, however—at only three years of age, young Orion was the family's first (and, mercifully, only) casualty of the ailment. Castor healed slowly, but he did heal. Today, the only evidence that he was ever sick are the scars littering his face, arms, and torso. From the boys, Elizabeth caught it as well; hers was an uphill battle, and many feared that she would join her young son in the ground. Mercifully, she was spared, though her sight was not. The years to follow were a challenge for the family. The grief of losing one child was a horror enough, but Elizabeth's loss of sight had to be dealt with, too. Household staff changed to persons more capable of dealing with her blindness; Elizabeth herself became withdrawn and awkward—which, in turn, was a challenge for her husband and remaining sons to overcome. Neighbors, cousins, and colleagues suffered their own losses, and family finances suffered as a result of countless changes both within and without the household. It was not, in truth, a happy life, though circumstances improved drastically as the years moved forward, and many of the years saw their happy moments One such moment was the birth of Castor's younger sister in March of 1878. Called Leda, she brought much joy back into the household, particularly to Elizabeth, who had always yearned for a daughter. The new arrival could not ease the loss of their son, but elated the Allaways nonetheless. It was startling news with a startling messenger. Though owls were not something foreign to the boy, owls perching upon his windowsill and bearing mail were something quite peculiar. Oddly, Castor was not as surprised as he would have thought by the strange sight before him, simply taking the letter—with some apprehension—from the bird and taking it downstairs to his parents before even reading it. It was George who read the parchment aloud to the rest of the family, trailing off when he realized what it was he was reading: Castor was a wizard? The idea took more than a little adjusting to. And most of the summer was spent trying to determine if it was actually true, in spite of the school representative who had arrived to reassure them. But, even though the family still had its doubts, Castor boarded the train to Hogwarts on September 1st as the letter had dictated, clad in robes and with a chest full of magical books, potion supplies, and the lot. With a wand in his pocket and his cat, a grey tabby called Hermes, under his arm, Castor boarded The Hogwarts Express and began his new life as a wizard. Upon arrival at the castle, the first year was placed without hesitation in Gryffindor house. The first term of the year proved to be less successful than desired. Though he proved himself excellent at magical theory, the performance of spells, brewing of potions, and simple nuances of the wizarding world managed to elude him. Though he was a kindly boy in a kindly house, there was more than one student who felt the need to have a go at him over his scars. Though he would never be called the worst in his classes, there were still abysmal students who insisted he would never be able to do magic properly because he was a "mudblood". As much as he loved his new life, such teasings and his failings as a wizard hurt him, and hurt him deeply. Circumstances improved in second year. He tried out for, and made, the house quidditch team. Friendships grew stronger and teasings lessened, though they were still there. With the help of more students more skilful, his performance in his classes gradually improved. He even made a point to learn the names and stories of the more successful muggleborns throughout history, in his efforts to counter japes that he would never succeed. It was late in the year that one of the older students introduced him to a cream that would help to hide almost completely his scars, but many of his supplies purchased for his second year were done so second hand so he could better afford it when his initial supply ran out. Years three and four continued in much the same manner, though the Gryffindor now had Ancient Studies, Care of Magical Creatures, and Earth Magic on his roster of courses. Fifth year, however, came with double surprises: both a silver P and silver C badges arrived in the summer months, indicating that Castor was to be both prefect and quidditch captain for his house. 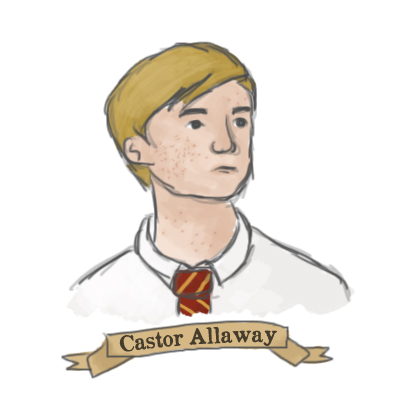 Filled with pride, and long since adjusted to his magical life, Castor tore through the remainder of his Hogwarts years, completing his magical education as Head Boy. There was but one hiccup: the death of his father by influenza in early 1887. This truly highlighted his mother’s insecurities about the magical world, as she took Leda to live with her parents, altogether cutting Castor off from her life. Ever the diligent twin, the muggle Pollux remained in the Irivngly home to which the family had moved in ’84, an inheritance left to Castor in his father’s will along with a modest allowance for each of the twins. At the conclusion of his studies at Hogwarts, Castor was torn: pursue a quidditch career, or become an auror—both dreams of his since his third year. After much pondering, the chaser signed on with the Chudley Cannons, and while he loves his newfound role, not a week goes by that he does not question whether it was the right decision. Not long before turning twenty, Castor makes the difficult choice to leave quidditch and pursue instead a career as an auror. ❧ Castor has a muggle, identical twin. ❧ Castor played for the Chudley Cannons, though was only on the reserve team. See you all Monday at 3pm EST, or somewhere around there! xoxo Bree for my rotating avs! Castor's face has several smallpox scars that are usually disguised with a salve.